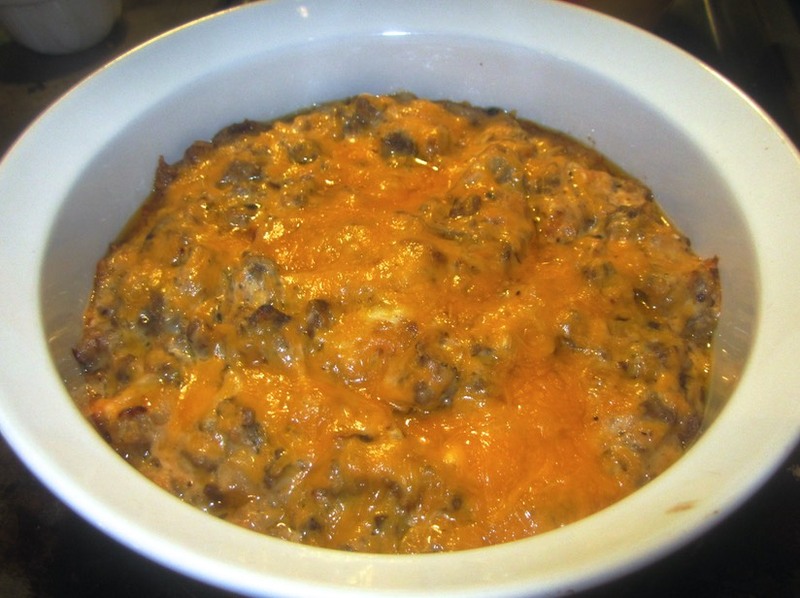 In a large skillet or Dutch oven, cook ground beef over medium high heat. Remove cooked beef from the skillet and drain any grease. Cook bacon in the same pan. Remove bacon, reserving about 1 Tbsp of bacon grease. Crumble bacon. Add chopped onion to the pan and sauté until soft and slightly caramelized, about 5 minutes. Return beef and bacon to the skillet. Pour dip into prepared casserole and bake for 25 to 30 minutes until everything is bubbly and yummy. Serve with your choice of condiments and bread or chips. * This was a nice thick dip. If you wanted to make it creamier you could always add a little extra cream cheese or mayo.